I've slowly been working my way through the many recommendations I got the last few times I posted about Demeter scents, and so far, the clear winner is Gingerale. As with any Demeter review, this will be brief: it is not a complicated fragrance, and does not require any lengthy description. Still, some of the Demeters are better than others at evoking whatever it is they are supposed to evoke. This one is perfect. It smells like — drum roll, please — ginger ale, and the opening is almost astonishingly effective at calling up the carbonated part; it literally tickles the nose. Admittedly, the fizz part is not long lasting, but the dry down is far from dull. It is a soft but bright ginger, lightly sweet, and the lasting power is nothing fabulous but it isn't horrible either: about average for a Demeter. Thanks to everyone who recommended this one! A 30 ml Pick-Me-Up Cologne Spray is $19, and Gingerale is also available in matching body products and Room Spray. For buying information, see the listing for Demeter under Perfume Houses. My favorite ginger edibles: Trader Joe's Uncrystallized Candied Ginger and Chocolove Crystallized in Dark Chocolate (the latter is a chocolate bar, and you can find it at Whole Foods or Food Source markets). If you have a favorite, especially one covered with chocolate, do comment! I wish someone would try out this recipe for making Gingerale at home using freshly grated ginger and baker's yeast, it sound fabulous but of course I am too lazy to do it myself. 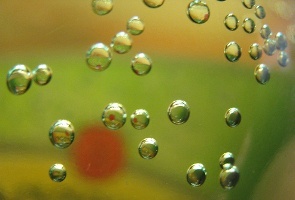 Note: image is Ginger Ale Bubbles [cropped] by wsweet321 at flickr; some rights reserved. It's not chocolate but I like the TJs triple ginger cookies, if I'm buying rather than making my own. I like to make ginger snaps and then double (or more) the amount of ginger. What is not to love about ginger? Yes, I think the Gingerale is pretty darn fabulous. Some might argue, why would you want to smell like gingerale? But hey, why would I want to smell like half the other stuff I own and love, either? I remember my father's one attempt at making ginger beer – which I think is the same kind of thíng. He brewed it in the garage. The bottles exploded one by one, so that we were too scared to go in to investigate! Amazingly, the car escaped unscathed, and the few bottles that survived were very nice. Put me off gingerale as a scent, though. This sounds like a project my son would love despite the fact that he hates gingerale — explosions & damage are right up his alley. Thanks! Thanks M, will look for the cookies! I loved their chocolate covered ginger until I tried the Chocolove, which is just much, much better. Hey, smelling like Gingerale is probably more acceptable than smelling like Fiery Curry — and now it occurs to me that I ought to try layering those 2. Try as I might, I cannot find a UK site that carries all the Demeter fragrances; just a limited amount. Looks like the newest ones only are coming up. Demeter never caught up here, in the UK. They used to be sold in Harvey Nicks. I believe Liberty stocks a small range. I love the biccies ' Ginger Nuts'. Mmmm! I dip them in my tea and they go all soggy! I have never seen a Demeter fragrance on sale in the UK. I will try Liberty when I next go to London. I'd like to get to smell at least one of them, they always sound crazy! Ok, I'm guessing 'biccies' is biscuits or cookies? I like this fragrance, too! It smells perfect, like gingerale and I do get compliments on it from men when I wear it. You must protect it from light. I was a perfume novice when I first got this, and had it at my desk at work and it got discolored and funky in the space of four months! I learned to keep all of them in the dark after that. Petite Cherie and Gardenia Passion from Annick Goutal are the same way. I won't buy anything larger than 1.7oz of either petite cherie or Gardenia passion anymore, and don't buy it online on Ebay unless it's from andyfrog or fragrancenet. Petite Cherie is the hardest — they ought to sell it in 15 ml bottles. I've given up on keeping even decants. I love ginger in general, esp candied ginger which I ate to ease my terrible morning sickness. I'm pleased that this is the Demeter that you consider the best, as it was the only one I ever bought, way back before I was really into perfume. But — perhaps they've changed the formulation since the mid '90's — I remember being very frustrated with the lack of staying power. On me it just disappeared, so I never bought another. No, it isn't long lasting — that is why I specified that it had staying power *for a Demeter*. Now that you can buy the minis for $5 each, I don't mind — they're fun for “scent memories”, but I don't think of them as all-day perfumes.